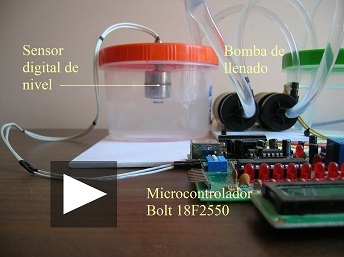 Demonstrative equipment of a digital automatic level control of water, with the RG-1045S sensor and Bolt 18F2550 system. 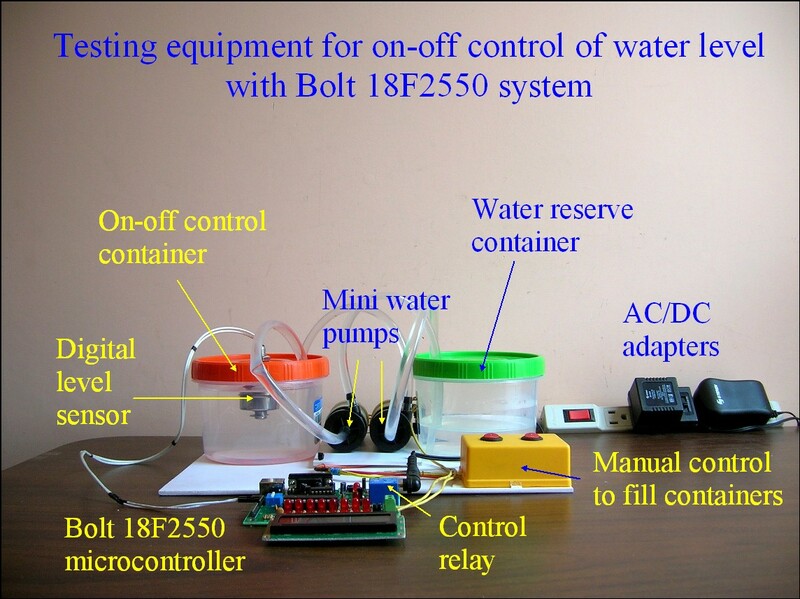 In this project, for teaching purposes, a simple model of an on-off automatic control filling a water container was built, using the Bolt 18F2550 system and the digital level sensor RG-1045S. The system can emulate the process repeatedly, and for this purpose includes a storage container (see Figure 1), which can be filled again and again through a mini water pump. It is a control system with1 input and 1 output, ie, the microcontroller Bolt receives a digital signal in input RC1 and, through its relay, activate the mini water pump. In figure 4 the simplified block diagram is shown. 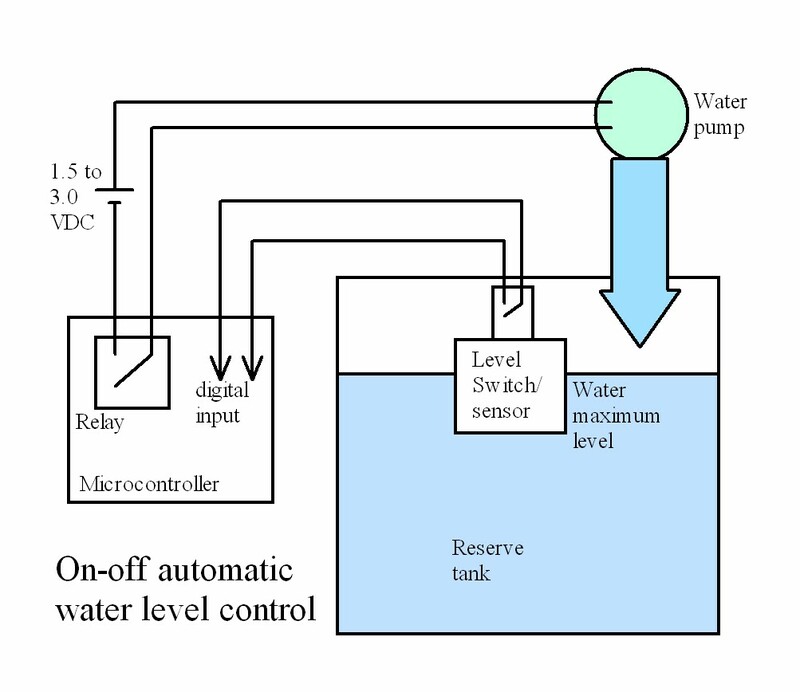 The basic operation of the automatic control is as follows: if a low water level is detected in the container (in which case the level sensor will close its switch), the microcontroller activates the filling pump. 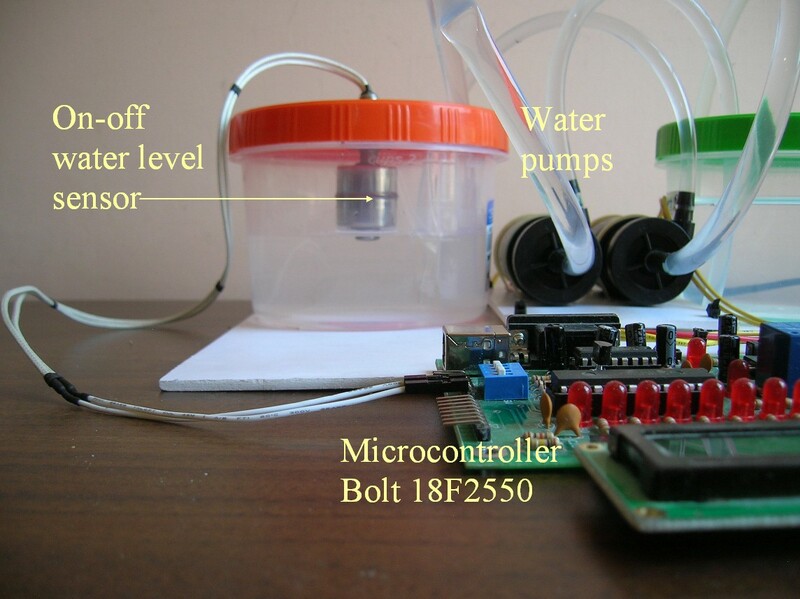 The water level will rise until the level sensor switch opens, event that will be detected by the microcontroller, and the pump shuts off. The level sensor has a hysteresis range, such that the water level starts to decline until the switch is closed again and the mini pump activates, repeating the filling cycle. 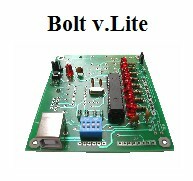 In the LCD, Bolt displays the status of automatic control process, as shown in Figure 2. If you want to repeat the experiment with completely empty container control, then the user has a two-button manual control (see Figure 1), to empty or fill the container. For power supply of devices, two AC/DC adapters are used, which can be seen in the photo of Figure 1. The first supplies the two mini water pumps 3 VDC at 1 ampere and the second feeds the Bolt system with a voltage of 7.5 VDC @ 300 ma. Figure 1: Devices used in the project. The green cap container emulates what would be the cistern and the red cap container, the water tank that will be filled. 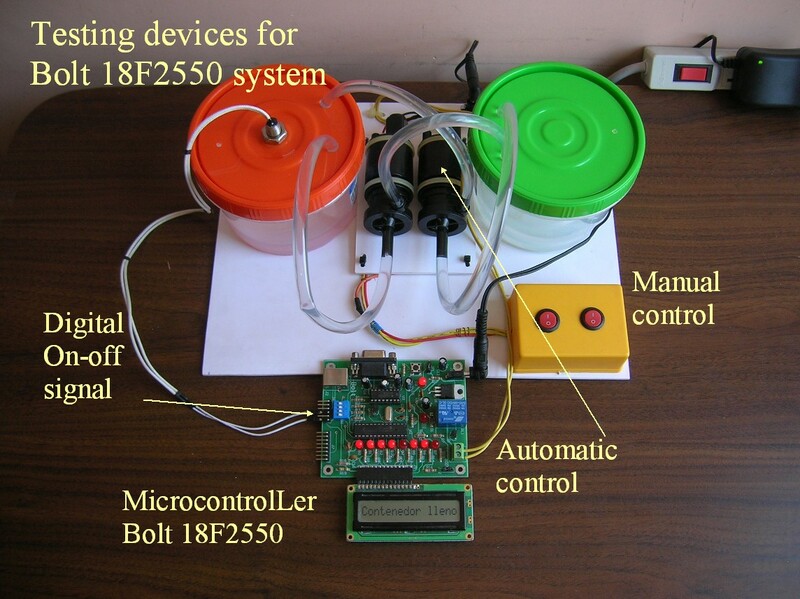 By means of two buttons, the pumps can be activated manually to repeat the experiment. Figure 2: Top view of the devices. 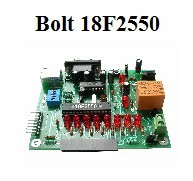 The Bolt 18F2550 microcontroller system uses its LCD display to show the status of the process. The microcontroller receives digital sensor signal on pin RC1 of the auxiliary port, while the relay terminals (green) are connected to the mini pump to activate the filling of the container. Figure 3: View of stainless steel level sensor. It consists of a cylindrical piece with its hollow interior, so that when the water is reaching the maximum level, by flotation, this piece rises and opens the switch contacts. Figure 4: The sensor can be seen as a normally closed switch, which opens when the water level is reached. This signal is fed to the input RC1 of Bolt auxiliary port. 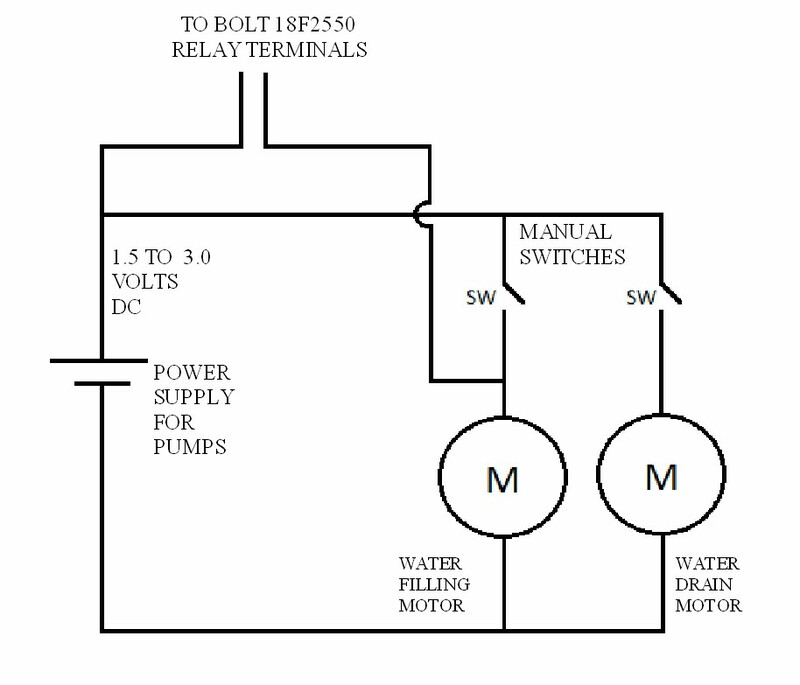 The mini water pump is energized with 3 VDC, by the microcontroller relay, as shown in Fig. Figure 5: The electrical connections to activate the two mini water pumps are shown here. 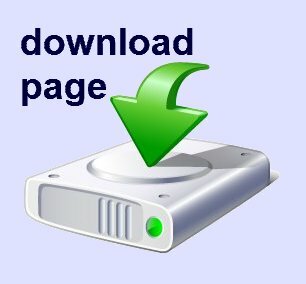 Filling any of the containers can be done manually by means of two switches (SW). In automatic mode, the relay of the microcontroller activates the filling pump.